It’s no secret: New York City's transit system is falling apart. 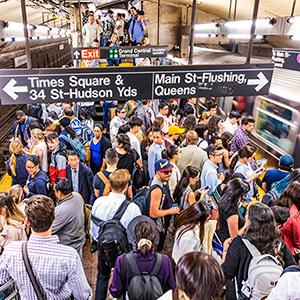 Crippling subway delays and over-crowding on platforms and in trains are on the rise — and your streets are more congested than ever. Long and frustrating commutes have long been a part of daily life in New York City; but we cannot continue to allow our infrastructure to deteriorate and our skies to be choked by air pollution from traffic congestion when there are practical solutions readily available. Now, we need Governor Cuomo and the New York Legislature to pass a robust congestion pricing plan this year that will not only create a steady revenue stream for public transit upgrades, but also reduce traffic congestion — and the smog and carbon emissions that come along with it. Take action today. Ask the State Assembly and Senate to pass a bold plan that raises at least $1.5 billion in annual net revenue for our failing transit system. State Senator John J. Flanagan Jr.
Like most New Yorkers, I am becoming increasingly frustrated and concerned about subway delays, overcrowded trains, and gridlocked streets. The plan proposed by Governor Cuomo's Fix NYC panel is exactly what the city needs to cut down on traffic congestion and its resulting air pollution; but unless the panel's proposed solutions are enacted into law, New Yorkers like myself will continue to struggle every day with reliably getting around the city safely and efficiently. Therefore, I urge you to pass a robust congestion pricing plan that will not only create a steady revenue stream for public transit upgrades, but also reduce traffic congestion and the smog and carbon emissions that come along with it. Any plan must include: *	Expanding transit service to underserved areas in Queens, Brooklyn, Bronx, and Staten Island. *	Charging a surcharge on trips made by taxis and rideshares, like Uber and Lyft, into the "taxi zone" -- south of 96th and 110th Streets in Manhattan -- which would generate millions of dollars in revenue for transit improvements in the outer boroughs. *	Charging trucks -- which account for only 8% of total vehicles in the city but are responsible for 18% of total transportation emissions and other passenger vehicles a fee to enter the highly congested CBD. We cannot continue to watch our city's infrastructure crumble while there are practical solutions readily available. I urge you to pass a robust congestion pricing plan this year.